Alessandra is not quite fifteen when her prosperous father brings a young painter back from Holland to adorn the new family chapel. Fascinated by his ability she is lured into closer involvement. On the streets of Florence she observes a terrible evil stalking the city and a fiery priest, who has set out to rid the city of vice, even art itself. 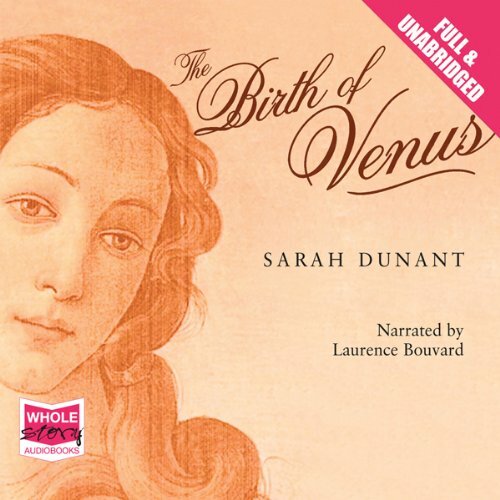 One can never be sure with a Sarah Dunant novel whether you will adore it or struggle with it. For me the Birth of Venus fell into the latter category. No one could fault the way Sarah Dunant conjures up the look and feel of Florence and its residents through a time of tumultuous change but oh I found the characters irritating and the central thread of the plot rather pointless. Many a time I almost gave up on this book which is most unusual for me. I nevertheless soldiered on and I obviously cared enough about the characters to want to know the end - but I'm afraid not a 5 star listen for me. Botticelli's painting is on the cover, it's called the Birth of Venus, and yet Botticelli barely makes a cameo. Instead, we get to hear about a later Renaissance painter, known for his broody Christianity, but his entire narrative is completely historically inaccurate. Like, every detail. It wasn't historic fiction so much as fiction in an alternate universe that resembles Renaissance Florence.